Pakistan's manufacturing sector is performing poorly relative to Bangladesh and India, according to the United Nations Industrial Development Organization 2018 report. 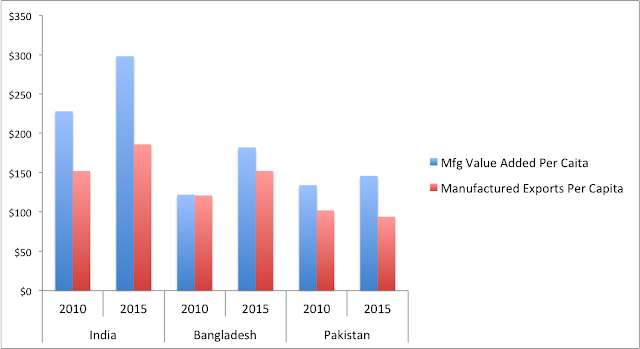 UNIDO data shows that Pakistan's per capita manufacturing value added is not only lower than its neighbors' but it's also growing more slowly since 2010. In fact, Pakistan's manufactured exports per capita have declined in the last decade. United Nations Industrial Development Organization, also called UNIDO, is a UN agency whose charter is to "promote and accelerate inclusive and sustainable industrial development (ISID) in Member States". It publishes an annual industrial development report that is "an established source of reference on industrial development. Previous editions have been examining the driving forces of industrialization and the positive factors that can lead to social inclusiveness and environmental sustainability. They have examined crucial components of the production side of industrialization, such as capacity building, energy efficiency, employment creation and technological change, to mention just a few." Pakistan's manufacturing sector is performing poorly relative to Bangladesh and India, according to the United Nations Industrial Development Organization 2018 report. 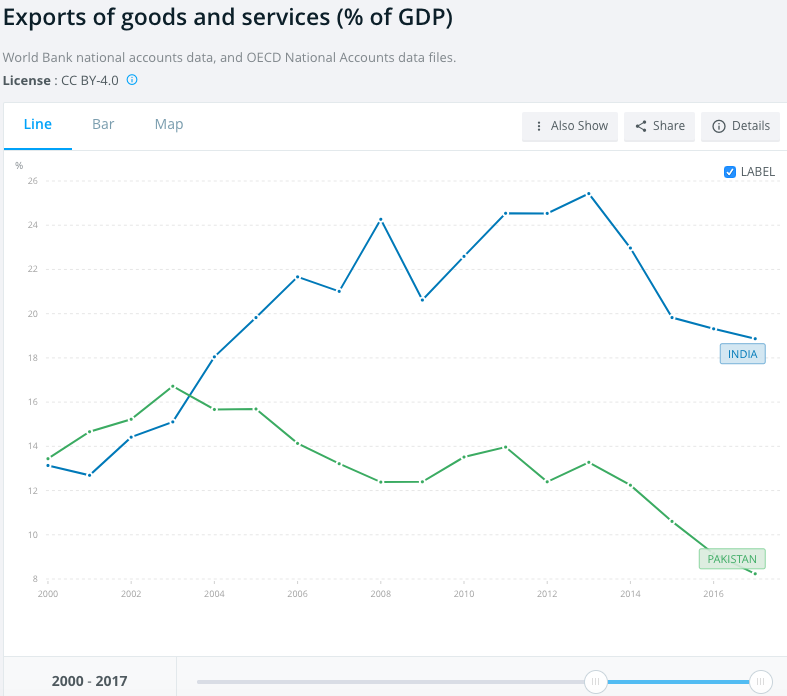 UNIDO data shows that Pakistan's per capita manufacturing value added is not only lower than its neighbors' but it's also growing more slowly since 2010. In fact, Pakistan's manufactured exports per capita have declined in the last decade. Pakistan's exports have declined from about 15% of GDP to about 8% since 2003. The nation's trade deficits are growing at an alarming rate as the imports continue to far outstrip exports. This situation is not sustainable. Chinese Ambassador Yao Jing has offered a helping hand to increase Chinese investment and trade in Pakistan. Pakistan's new government led by Prime Minister Imran Khan should take the Chinese Ambassador's plan seriously. Finance Minister Asad Umar needs to form a high-powered team of top bureaucrats and leading businessmen on a comprehensive plan to attract investments in export-oriented industries and diversify and grow exports to China and other countries. Renault, which is one of the top international car manufacturing companies, has partnered with the largest U.A.E.-based entity Al-Futtaim Group. The joint venture is set to bring the latest technology to their manufacturing plant in Pakistan. The company will initially launch five variants to make a strong start in the Pakistani auto sector. The Al-Futtaim Group has already started establishing its offices in Pakistan. The two companies will join hands to establish their showrooms and other offices in the country by 2019 whereas the French auto giant's variants are likely to get an official launch by June 2020. The company's auto manufacturing plant in Faisalabad will have the production capacity of 50,000 vehicles per year. It will conduct sales through the local dealerships. The arrival of five new variants by the top automaker will provide Pakistani buyers with additional options to choose from. The advent of Renault in Pakistan is likely to hurt the market monopoly of Japanese automakers like Toyota, Suzuki, and Honda. It would also inspire the other automakers in the Pakistani auto market to bring more investment in Pakistan. #Pakistan's #cement industry earned foreign exchange revenue of US$27.57m by #export of 617,745t of cement during the month of August 2018, up from US$20.96m in prior month. According to Federal Bureau of Statistics, Pakistan's cement industry earned foreign exchange revenue of US$27.57m by exporting 617,745t of cement during the month of August 2018, compared to US$20.96m from exporting 475,134t of cement in previous month. This equated to a growth of 31.5 per cent and 30 per cent in terms of value and quantity, respectively MoM. When compared with the figure of August 2017, earning of US$22.41m from 442,945t of cement – it translates to a YoY growth of 23 per cent in foreign currency earnings and 39.5 per cent in quantity. On a cumulative basis, export revenue during July-August 2018 surged by eight per cent to US$48.53m with exports of 1.09Mt of cement and US$44.93m from exports of 871,434t in July-August 2017. The growth in Pakistan rupees rose by 27.1 per cent to PKR6bn during this period. Data from the All Pakistan Cement Manufacturers Association (APCMA) recorded that cement exports from Pakistan to Afghanistan and India fell by 34 per cent and 22 per cent to 278,253t and 164,552t, respectively during first two months of the current financial year. However, cement exports to rest of the world rose by 149 per cent to about 633,385t during this period.